If you’ve been putting up with headaches for far too long and are looking for a drug-free way to manage them, chiropractic is a remarkably effective solution. A woman of about 30 had been suffering from headaches since she was a teenager, and had never gone to a chiropractor for relief. I performed an exam on her and found that the top bone in her neck was rotated out of alignment. First, I performed trigger point therapy on her head and upper back, then I did some gentle stretching on her neck and lastly adjusted the vertebra in her upper neck that was out of alignment, causing her headaches. This patient followed up with me 1 week later. She reported that during the week since her first treatment, she had not had 1 headache for the first time in years. 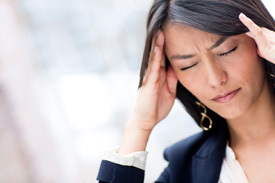 She had previously been experiencing these severe headaches and migraines about 3-4 times per week. Her boyfriend even commented to her, that she had not had a headache in a week since getting adjusted. It’s not unusual to see that many people who have suffered for 20 years will come in and we find that their spine is rotated out of alignment. And we adjust it, and the headaches go away. Some patients come in regularly maybe once a month or once every two months as adjustments to the neck help prevent those headaches from returning. For those with a more severe case where they might be some degeneration in the neck that’s causing the headaches, we will take X-rays here at our clinic. For some of our patients with headaches, we also will refer them to our massage therapist. We find that their upper back is very tight so we will have them get a massage from our therapist to help them reduce the tightness in their upper back. Headaches don’t have to sideline you from your favorite activities in life. Unlike over-the-counter pain relievers that mask the symptoms, chiropractic care gets to the root of the problem, so you can get the lasting relief you need.